An inline automation system is a very productive type of factory automation equipment. An inline automation system requires exceptional engineering to meet the unique requirements of each customer and their production needs. Our inline automation systems are built to be user friendly for easy operation and maintenance. Our systems also typically have a smaller footprint. Inline automation systems are excellent for heavy-duty applications like metal stampings and other large or heavy components. Dial-X Automated Equipment, Inc. offers an extensive line of specialty components for a variety of automated equipment applications, including inline special machines and gravity feeders. 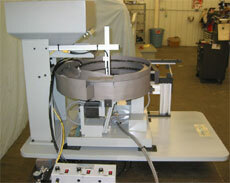 For further information or a free quote on inline automation systems, contact Dial-X Automated Equipment, Inc.